Eating just soup for lunch is a convenient way to cut calories for weight loss. A weight loss program should include a balanced diet and regular exercise -- and soup can provide a nutritious and potentially low-calorie lunch. Foods with low energy-density, meaning relatively few calories for the amount of food, help fill you up and promote weight loss, according to the Centers for Diseased Control and Prevention. Many soups are a low-energy density meal option for lunch -- and soup can help reduce your appetite. Eat a nutritious breakfast that includes protein such as an egg-white vegetable omelet or oatmeal with plain low-fat yogurt and fresh fruit. Eating breakfast gives you energy and satisfies your appetite. Eat enough for breakfast so you can stick to your plan and eat just soup for lunch. Eat just soup for lunch instead of a higher-calorie meal. Choose broth or tomato-based soups, and soups featuring lean protein such as beans, chicken, fish or seafood with vegetables. Avoid soups made with fatty meats or cream. For example, if you usually eat 700 calories for lunch and you eat a 200-calorie bowl of soup instead, you save 500 calories. Set an eating cut-off time to avoid the risk of taking in unnecessary calories after dinner. Make it a habit to stop eating 2 to 3 hours before bedtime to support your weight loss success. This strategy helps avoid the risk of empty-calorie snacks -- and helps you wake up with an appetite for breakfast to get the next day of your just-soup-for-lunch diet off to a good start. Consuming 500 calories a day below your maintenance level can help you lose 1 pound a week. 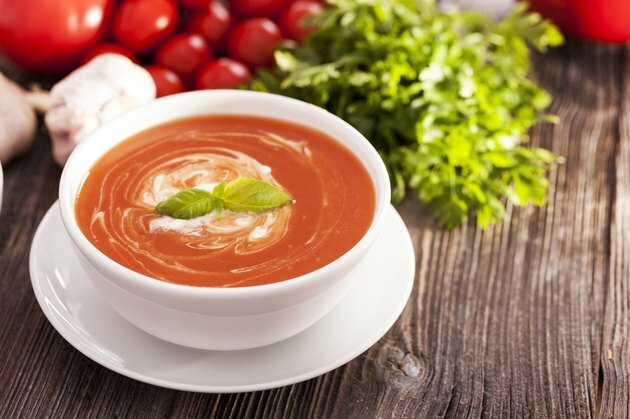 Make or order soups that contain vegetables to use their low energy-density advantage. Substitute celery, broccoli and cauliflower for high energy-density ingredients such as cheese, cream or fatty meats. Keep a food journal to make sure you don't consume excess calories later in the day. If you're too hungry after lunch when you eat just soup, eat soup at the beginning of a low-calorie lunch to reduce your appetite. Canned and packaged soups can be high in sodium. Choose low-sodium versions.